Fourth Row Center: Film Writings by Jason Bailey: On DVD: "Taken"
I’ve rarely seen a movie tighten as quickly and completely as Pierre Morel’s Taken; it’s like someone flips a switch, and then it goes to work on you. 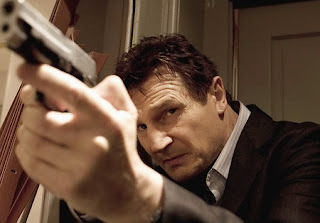 The film’s first half-hour consists of set-up that could be charitably called labored; expositional dialogue is awkward as all-get-out, and the stacking of the deck against Liam Neeson’s estranged father character is shameless (he goes to her birthday party and her stepfather literally gives her a pony). But then it hits the thirty-minute mark, and he’s on the phone with his daughter, who sees her friend getting kidnapped, and knows that she’s next. And suddenly the film pulls taut; from that point on, it’s a terrific thriller, sturdy and genuinely exciting. It comes from the screenwriting team of Luc Besson and Robert Mark Kamen, but it is thankfully in the grounded-in-at-least-a-modicum-of-reality mode of their Kiss of the Dragon and Besson’s Leon (as opposed to the physics-defying theatrics of their goofy Transporter scripts). These two know how to tee up a set piece, and director Morel knows how to execute one. In the leading role, Liam Neeson is (to my surprise) perfectly cast; he’s steely and efficient, bringing genuine weight and gravitas to a role that could have probably been played by a lightweight. But he creates a real rooting interest, and though his acting beat at the conclusion of the big action climax is brief, he plays it for all it’s worth. Neeson is a totally credible action hero, and Taken is a surprisingly well-made and comparatively intelligent popcorn picture.